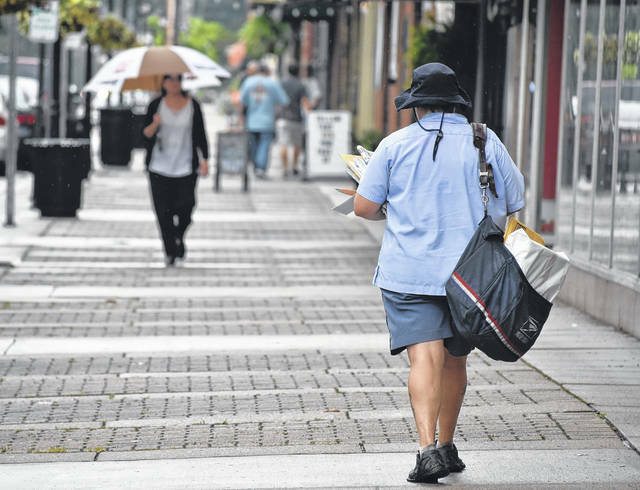 A postal worker strides up Second Avenue during a wet day in Gallipolis, not letting rain stand in the way of duty. Weather is anticipated to be stormy, Friday, with a high of 81 degrees and low of 66 degrees. The weekend is also anticipated to be wet with a few showers and thunderstorms, although some sun is expected to show Sunday. Temperatures lows over the weekend are predicted to be in the mid-60s and highs in the mid-80s.